“Get back into Shape”: That's the most common New Year Resolution for many people. 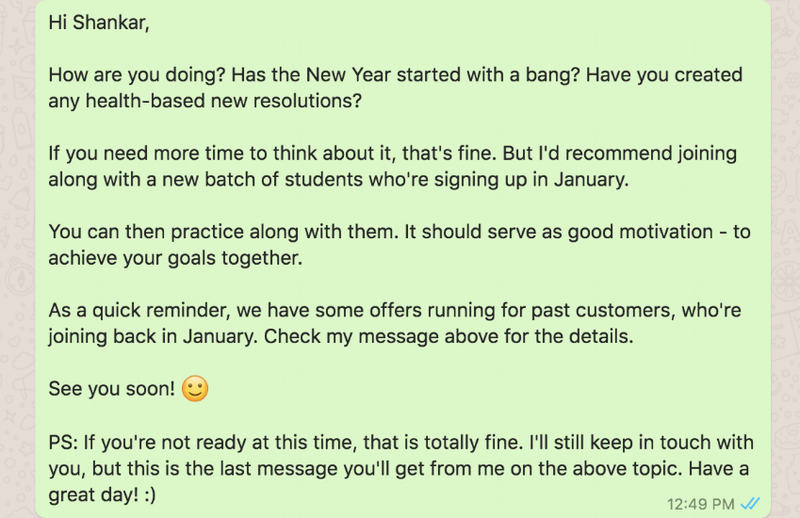 So, January is a great time to get new customers. Which method is going to work the best for you? It must already be obvious to you. This is perhaps the easiest method to increase your membership. Here's my own story: I signed up at a yoga center near my home back in 2016. I was regular in my practice until early this year. But then I stopped practicing for almost 7 months. During those 7 months, I saw many offers from other yoga centers. But when I was ready to start my practice again, I just signed up again at my old yoga center. Even though they did not give me any discounts. Your customers are probably going to do the same thing. Look at your data and find the names of the top 20-30 customers in the last 12 months. Then call them and tell them to restart practice. WhatsApp Broadcast: Create a WhatsApp Broadcast of all of your past members and send it out to each of them. 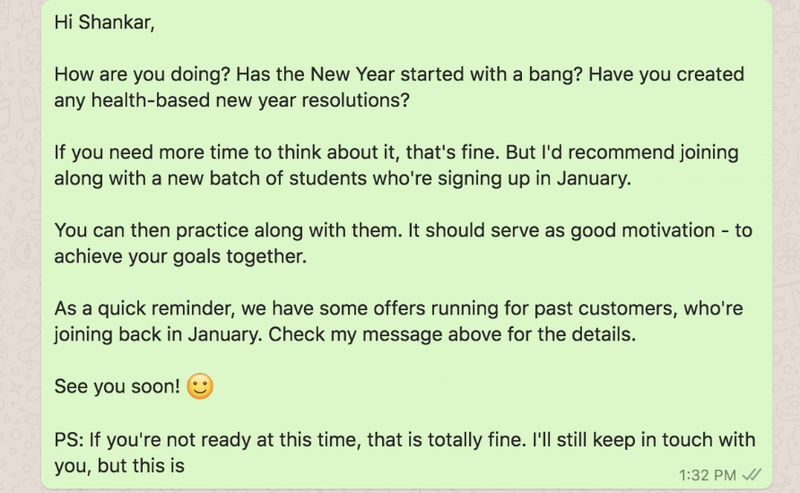 Make sure to add the dates [Dec 20th, Jan 1st, Jan 10th] in your calendar - so you don't forget to send out the messages on time. NOTE: Please keep in mind, that broadcast messages can only be sent to customers, who have saved your number in their contacts. Import all of your past customers in our database, along with their last billing date. Review the messages, dates and hit "Schedule"
We'll automatically select all of your "dormant" customers and send them the WhatsApp messages on the scheduled days. Automatically. Your customers can then respond in WhatsApp - and start a conversation with you right then and there. Write to me at vaidy@goodkarmayoga.in, if you’d like to learn more about the above feature. Whether you choose to use Good Karma or want to do this on your own, I'd recommend that you start planning this activity right away. There's only 6 weeks left. If you want to copy/paste the above messages, you can find all of them here.